Chris Kielbratowski moved from Poland to Nova Scotia in 1952, a young man eager to start a new life in Canada. He brought with him the knowledge of old world recipes and skill in the techniques of meat processing. In 1953, he and his brother Max opened a meat and deli shop called Atlantic Packers, on Gottingen Street in Halifax. In addition to working in the shop, Chris would sell his products door to door and at the Halifax Saturday Farmers’ Market. From 1957 through the late seventies, Chris also operated one of the largest mixed farms in the Eastern Passage area of Nova Scotia. His farm operation was complimented by a small meat processing operation specializing in unique European smoked meat products. Chris was a family man, who raised his children on the values of hard work, honesty and integrity. The family worked together to build the foundation of Chris Brothers and grow the reputation of their quality meat products. They operated several popular retail deli shops, where loyal customers regularly went for all their meat purchases. Max went on to open the successful Brother’s Meat Market, still in operation today on Agricola Street in Halifax. Born in Zalno, Poland, September 26, 1924, Chris was well known throughout his life for his kindness, respect, generosity and concern for others. Over several decades Chris built a deli and meat business that stood for exceptional quality, taste and uniqueness. While Chris Brothers were known for great quality products, they were most famous for their old-world style smoked pepperoni. In 1980, the second generation of the Kielbratowski family, brothers Victor, David and Rick assumed ownership and management of the company. They continued to grow the business and expand their operations. A provincial processing facility fronted by an old-style service oriented, fresh meat and deli shop was built in Cole Harbour, Nova Scotia. Twenty-two years later, in 2002, with nine international meat processing awards and a pepperoni reputation that stretched across Canada, Chris Brothers opened a federally inspected establishment. 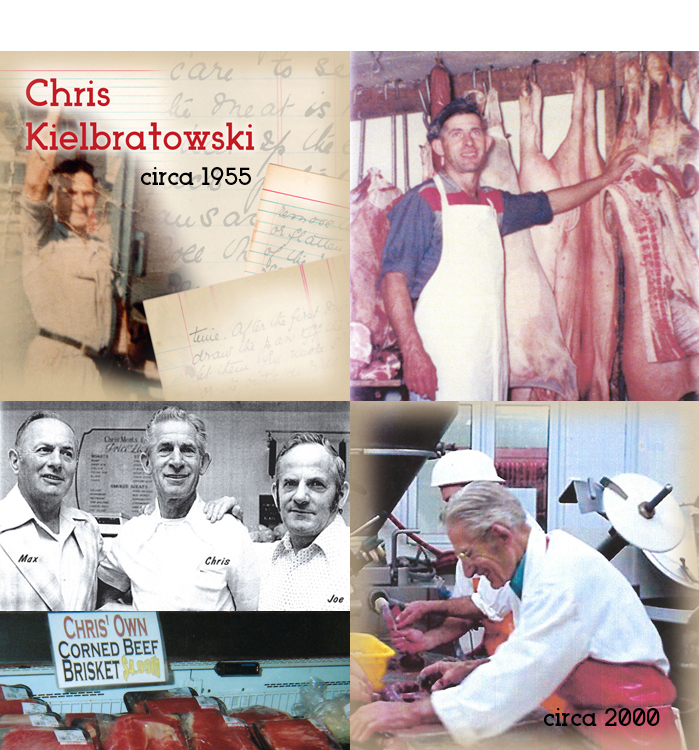 The Kielbratowski family continued to operate Chris Brothers until 2005. Bonté Foods Limited purchased the name, recipes and assets of Chris Brothers in 2005 and was proud to incorporate the company into the Bonté Foods facility in Dieppe, New Brunswick. Bonté continues to use the same recipe using naturally smoked wood, that was passed down to them by the Keilbratowski family. In 2005 and 2006, the Kielbratowski family, Brenda, David and Ricky, worked tirelessly with Bonté Foods to ensure our product is exactly what made Chris Brothers pepperoni the best pepperoni on the planet. A well-loved product, Chris Brothers pepperoni became so popular it was often featured on episodes of the iconic Trailer Park Boys television series. Bonté began operation in 1977 under the name Greco Foods Limited. The main purpose at that time was to produce and supply a growing number of Greco Donair Restaurants with donair and pizza products. Our products now include all natural and shaved deli meats, bacon, beef, bologna, donair, pepperoni, salami, sausage, salt meat, and mustards. Chris Brothers products are gluten free. Bonté continues to grow and after several expansions is now a 66,000 square foot facility. Today Bonté Foods is Atlantic Canada’s largest deli meat producer and its signature brand – Chris Brothers – is well known for being ‘Atlantic Canada’s Deli’. Recent awards include NB Exporter of the Year, GMCC People’s Choice Award, Expansion Dieppe’s Business Excellence Award and GMCC Excellence in Business Award. In 2016 Bonté won the coveted Canada’s Best Managed Companies Award. Bonté is Canada’s largest producer of donair products and is the country’s largest producer of donair and gyros ‘meat cones’. In addition to being federally inspected, Bonté Foods is also BRC certified, HACCP recognized and has an on-site quality assurance lab for its own testing and R&D. Every Atlantic Canadian knows that Chris Brothers stands for exceptional quality, taste and uniqueness. Today Chris would be proud to know we have never faltered from his legacy of quality, taste and value. That attention to old world recipes and amazing flavour has made Chris Brothers products famous across Canada. Look for our products in a supermarket, restaurant or anywhere great meat products are sold. Chris and his family were community minded and giving people who contributed on a regular basis to charity and sport. Like Chris and his family, we at Bonté believe in giving back to our community. In 2017, we announced a $50,000 donation to the Ray of Hope Soup Kitchen in Moncton, New Brunswick as well as other support initiatives. This commitment is a $10,000 annual donation over five years.